One disc is all you need to get started! As your skills advance, you may find yourself adding drivers, putters and mid-range discs to your bag. The game's lure is the constant challenge to throw a disc with power and accuracy. Aside being a fun social game, it’s a sport for all ages and all levels of fitness. The game is played much like traditional golf but with a Frisbee, or flying disc, in place of the golf ball and club. The disc is thrown from a tee area to a target, referred to as the “hole” (elevated metal basket with a metal chain net) with the main object to complete each hole in the fewest number of throws. The Knoxville Disc Golf Club hosts tournaments and events for beginners and pros. Scenic 9-hole course features a good mix of wooded and open fairways. Each hole has a separate short and long teepad. City of Knoxville's newest course was designed for ages 8 to 12 to try out the sport and gain skills, but it is open to all ages and skill levels. The course includes nine baskets with two tee pads per basket, giving various skill level options and doubling the course length. Located on a university campus just 12 miles from downtown Knoxville, the 9-hole course is set away from all buildings and walkways. Course features long distances over rolling hills, with only a couple of wooded holes still laid out in the open. Great for intermediate and rec players, while offering lengthy holes that will force advanced players to dig deep for safe long drives. Newly redesigned and just minutes from downtown, this 18-hole tournament level course sprawls over hilly terrain with tall shade trees and long grassy fairways. Nine-hole disc golf course is open to the public from sunrise to sunset. Pellissippi students can check out discs at the Student Recreation Center, but the public needs to bring their own. Course is challenging, presenting a number of formidable shots, from navigating tight tee shots to subtle but difficult elevation changes. The three-hole tour around the pond is one of the most exciting three-hole stretches in disc golf. 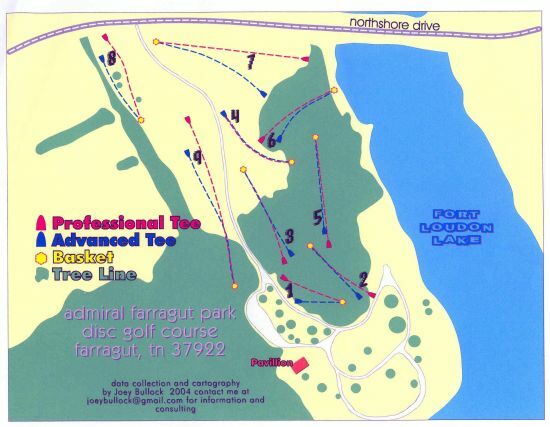 New 9-hole disc/foot golf course in west Knox County. Disc/Foot Golf is played like traditional golf, but with flying discs or soccer balls instead of golf balls and clubs. One point (stroke) is counted each time the disc is thrown or ball is kicked. The goal is to play each hole in the fewest "strokes" possible. The player with the lowest total strokes for the entire course wins. There are holes with flags for the soccer balls near the disc golf baskets, and the tee pads are the same. Each tee pad show the distances to either the basket or hole. 9-hole fun course in the heart of Powell. Some difficulty involved as a few shots play through tightly wooded hallways. Alternate tees on #1 and #8. Restroom, water fountain, and covered pavilion at the front of the park. A non-smoking campaign funded the installation of the course and smoking is discouraged at the park entirely — please respect the community. This very technical 18-hole course is played in the woods with short and long tees, and some elevation changes. Recently renovated from 9-hole course to a full 18-holes, which including the addition of good brick teepads. The course can vary in difficulty, with two tees and two baskets per hole. The longest hole is 1,200 feet from the basket, and 15 of the 18 holes are in the woods. Gently rolling hills accent this tournament level 18-hole course of mostly open fairways. Features include large teepads, nice tee signs, and multiple pin placements. There is a practice putting basket, picnic table, and bulletin board near the 1st tee. Beautifully balanced and professionally designed tournament quality course. The front 9 are mostly wooded, and the back 9 are mostly open. There are 36 baskets in place - shorter blue baskets and longer green ones. Course map posted here and at the kiosk near the parking lot. Two practice baskets. CARL YEARWOOD PARK- Challenging but short Par 3 course that surrounds Carl Yearwood Softball field. This course has tee signs, access to a water fountain and restrooms, and there are two different basket locations and tee lengths on each hole. Mix of hardwood and evergreens. Several low ceiling shots and water come into play on a couple of holes. GROVES PARK - known locally as The Mounds. The course is situated on a portion of the former South Hills Golf Course property. 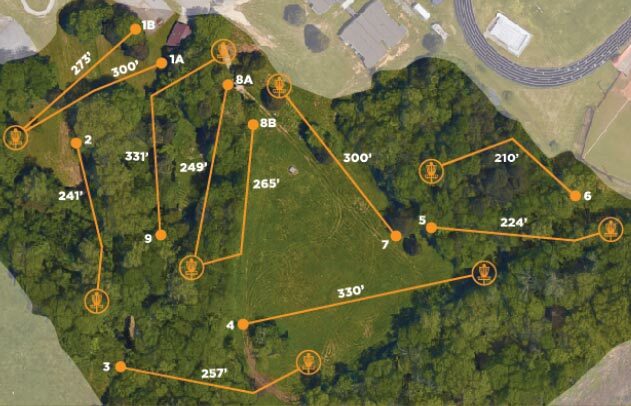 The 18-hole disc golf course has four tee lengths on each hole to provide a fun challenge for beginners, intermediate players, advanced players, and professionals. Amenities like tee signs and concrete tee pads are coming soon, but more funding is needed to complete them. Two large multipurpose turf-areas, and a walking trail (1.2 miles) are also planned for the park area.the 18-hole course at Groves Park is a long and mostly open course resting upon a beautifully mature landscape. Tee throws must be completed within or behind the designated tee area. Do not throw until the players in front of you are out of range. The spot where the previous throw has landed, mark with a mini disc or turn over the thrown disc, directly towards the hole or dog leg. Any disc that comes to rest above the ground is considered an un-playable lie. The disc must be thrown from the lie on the ground, directly underneath the un-playable lie. Relocated to avoid damage to the vegetation. A throw that lands out of bounds, must be played from a point 3 feet in bounds from where the disc went out of bounds. Permanent water hazards and public roads are always out of bounds. Course Courtesy — Please pick up trash and help new players play by the rules. To a fisherman, nothing beats a nice sunny day — or any day — out fishing! So grab your rod and reel and head to one of our many lakes, rivers, or mountain streams. A day on the lake — barely a ripple in sight, you're here to enjoy the serenity, to test your angling skills. A splash disturbs the calm letting you know there are fish feeding, can you convince them that your hook is dinner? The challenge begins. Lake fishing can be a solo adventure or a great way to connect with family and friends and experience the outdoors together. Enjoy some good ole fishin' time at one of our large reservoirs, scenic quarries, or small lakes and ponds. Some question why someone would want to fish a mountain stream when they’re usually more difficult to get to, biting insects are plentiful, and streams are rarely large enough to hold large fish. We take a different approach — difficult to get to means you might have this sequestered location all to yourself with more fish to catch. Biting insects indicate that the fish have a source of food for their livelihood and hints at what lure might work toward your advantage. And the big plus, smaller fish tend to be tastier, easier to clean and cook. Check out our list of mountain streams and see if you don’t get hooked! On fishing that is. River fishing presents a different set of challenges. Here, the fish live in a constantly moving world. They’re more active and more athletic. And then there are other hurdles — the water is too fast, too slow, too muddy, too clear, too high or too low to — now isn’t that why you come to fish the river? The French Broad & Upper TN River Blueways map is an excellent resource for locating piers, docks, put-ins, marinas and other facts and points of interest. The proposed 50-mile Pellissippi Blueway will feature the water trail along the Pellissippi/Clinch River. We're a waterfront city, it's only natural that we have an abundance of local greenways and parks that provide shoreline, piers and boat ramps to get you out on the water. It's almost like walking out your back door to fish! When you purchase a fishing license, you’re helping to protect, preserve and enhance the sport of fishing today and for generations to come, so be sure to meet state licensing requirements whenever you fish in the State of Tennessee. Children under the age of thirteen are exempt from licensing requirements, but Tennessee residents aged 13-15 require an $8.00 seasonal license. Adult state residents (16 and over) require a $28.00 seasonal resident’s hunting/trapping/fishing combination license; optional annual trout stamp is an additional $18 (NO trout may be harvested without one). One-day resident licenses are $5.50. Non-resident licenses are slightly more expensive: annual combo licenses are $41.00, Junior (13-15) licenses are $9.00, 3-day licenses cost $16.50, and 10-day licenses cost $25.50. Be sure and observe all park rules, stay off of private property, and leave the area as you found it, or better — and please don’t litter.